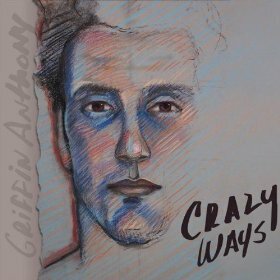 Griffin Anthony's Second Studio Album "Crazy Ways"
Originally from upstate New York, Griffin Anthony has locked himself into a very unique breed of musicians. One spin of his second studio album “Crazy Ways” and you will hear this unique blend mixing hip-hop beats with quick catchy lyrics, all backed by a solid band with some impressive guitar work. My favorite track from the album is the title track. “Crazy Ways” brings you back to a ’70s style disco jam. The song reminds me of something that The Cab did a few years back on the song “That ’70s Song.” Despite the ironic name, both artists got it right, bringing you back to a very specific time in music. Anthony’s unique style in this song is most closely related to another fusion group from our generation. Gym Class Heroes have a knack for instrumentals and hip-hop and whether he was intending to or not, Anthony’s “Crazy Ways” provides a really upbeat hip-hop song on a record full of ballads and sentimental gems. Killer song! Love it! Griff is great. What say we all parachute out of a plane in gray jumpsuits and land near a high school in Patrick Swayze’s honor? Harris' Song of the Week: Walk Away by Ballyhoo!